Happy Holidays, Team Tutu! It’s been a crazy season for us. We have been working through some nagging injuries and adulting far more than we would prefer over the past couple of months. Thankfully, we had a chance for some relief over Christmas in the form of 24/7 PJ wearing and cookie eating. We are definitely looking forward to a new year and the 2018 race season. 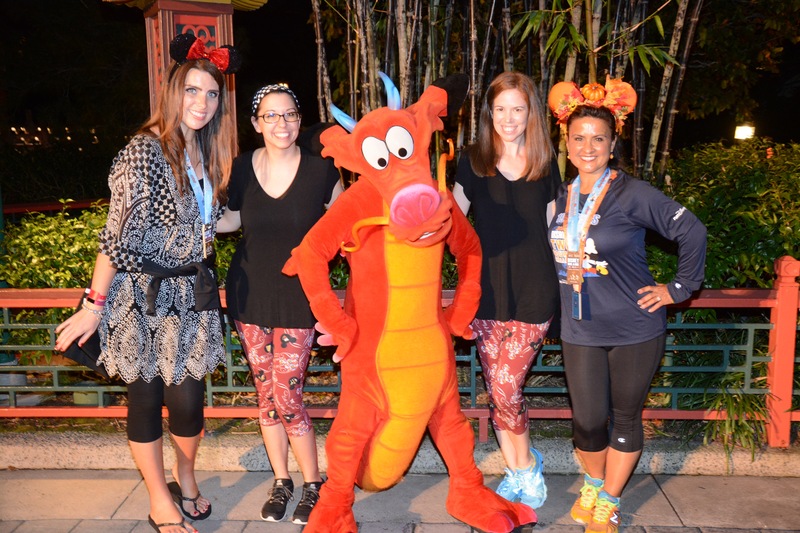 We will be kicking off the year by running the Walt Disney World Marathon and hanging out in Disney World! Before we ring in the new year, we’d like to take a moment to recap our last couple of major races from 2017. 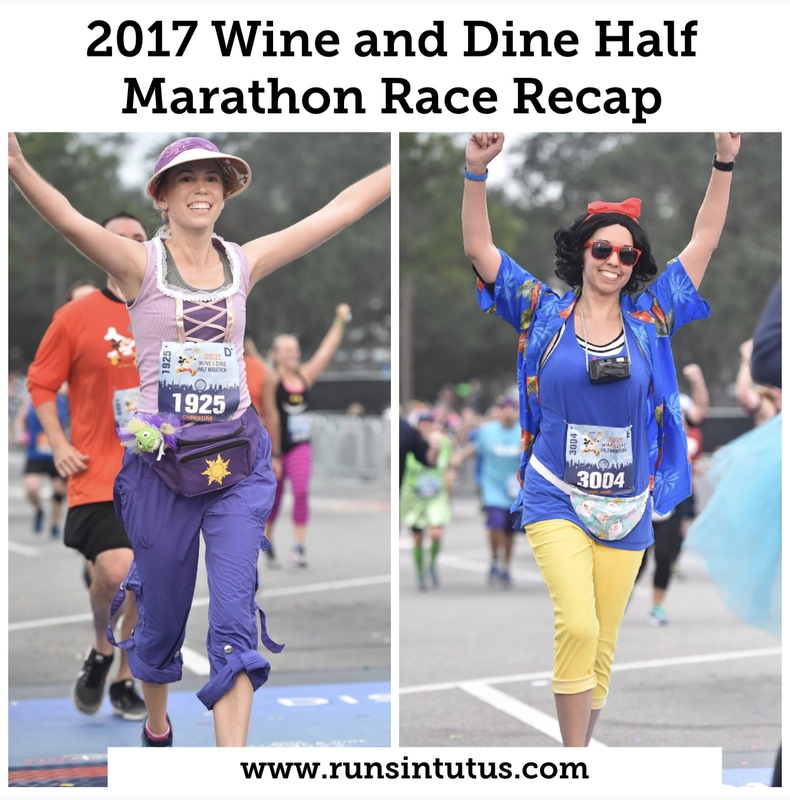 We had a back-to-back race adventure in November that we definitely need to recap before the ball drops on the new year! 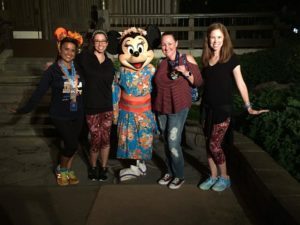 We finished out our year of races by traveling coast to coast to Disney World to run the Wine and Dine Half Marathon and then to Disneyland the following weekend for the Avengers Half Marathon. It was one magical week! Here is a recap of the Wine and Dine portion of the trip. We arrived in Orlando towards the end of the weekend as this race was the first leg of a coast to coast journey for us. Melanie and I flew in on Saturday morning and went straight to the expo. Amanda sat out for this race and kept it classy in California. Sadly, it didn’t work out for her to fly all the way from LA to Orlando in time to do the race and get back to work. We missed her, but we certainly understand she’s gotta keep up the Princess Tiana work hustle to sustain our level of Disney addiction over the long-term. We got to the expo an hour before it closed for the weekend. It was nice because there were no crowds or lines anywhere in the expo area, but it was also a bit of a bummer because we didn’t have a chance to say hello to any of our running friends. We did manage to take one picture with this super cute picture frame! We loved the travel theme for the race. The cute artwork with Mickey running with the suitcase was adorable, but, to be honest, we were not huge fans of the bright orange shirt. I ended up getting the shirt in my husband’s size so he can layer with it on the one day a year it is cold enough to wear long sleeves in Texas. I am sure there are some folks who loved the shirts, but I have a special dislike for orange and red shirts because I am a ginger and those colors are NOT in my color wheel. Orange and red are basically ginger camouflage. Speaking of camouflage, the shirt was so bright that the volunteer who handed Melanie her shirt said, “That shirt is so bright you can go hunting in the woods and nobody will shoot you!” Here is a glorious photo of the Cozy-Cone orange shirt with #nofilter. It is just that bright. We both dressed as tacky tourist princesses for this race. Melanie dressed as tacky tourist Snow White and I dressed as tacky tourist Rapunzel. Full credit for the costume idea goes to Melanie. We went back and forth for a long time about our costumes before Melanie convinced me that tacky tourist princesses would be the way to go. I was convinced I had to wear a tutu and tried to make another costume idea work before I agreed to the tourists. I am so glad I jumped on the tacky tourist bandwagon! It would have been a huge mistake to pass up the chance to wear a fanny pack! These costumes were really easy to put together. We didn’t have to do any major sewing or crafting to put this look together which was great considering we also had to finish up costumes for Avengers half the following weekend! We both decided to fully commit to the princess looks and wear wigs. 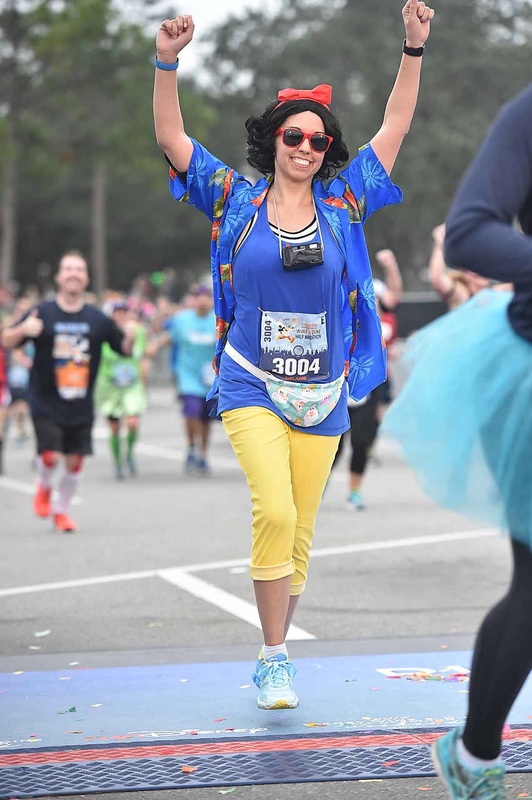 This was the first time we attempted a half marathon in a wig and it wasn’t too bad. We were fortunate that the weather was perfect the morning of the race, which definitely made it easier to run 13.1 miles in a wig. Tacky tourist Snow White running costume. Melanie wore a black wig and added the signature red Snow White Ribbon to incorporate some of the iconic pieces of that character. She hit the jackpot on Etsy and found an epic fanny pack made with adorable seven dwarfs themed fabric! 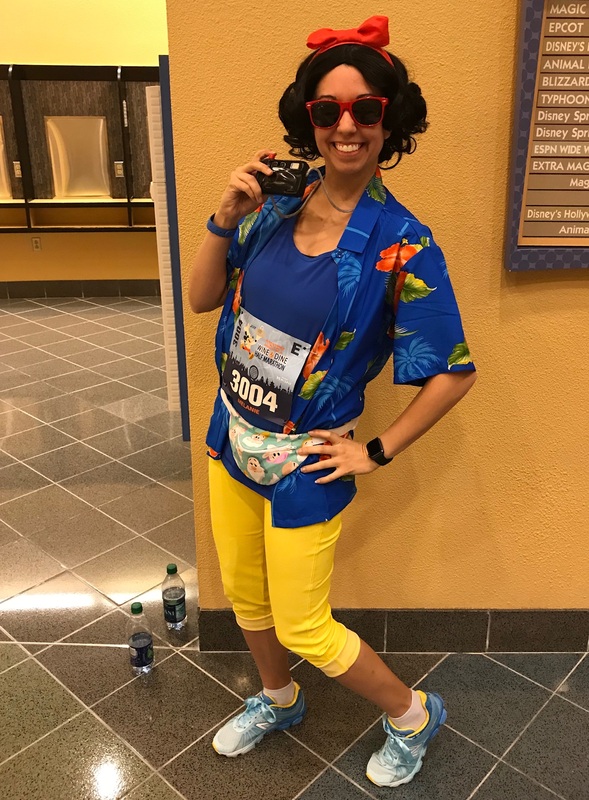 She polished off the tourist theme with a Hawaiian shirt and leggings that still incorporated blue and yellow Snow White colors. She found a cheap plastic pretend camera on Amazon and wore a pair of red sunglasses. She looked exactly like Snow White! I bought a cheap blonde wig from Party City and braided it to look like Rapunzel’s braid. I embellished the braid with small purple and yellow flowers that I had already glued on bobby pins from the time I dressed as Rapunzel for Princess Half Marathon. I wore a large sunhat that had a strap in the back like a baseball hat. I put my hair in a bun so that the bun would fit through the back of the sunhat and I bobby-pinned the wig to my bun. 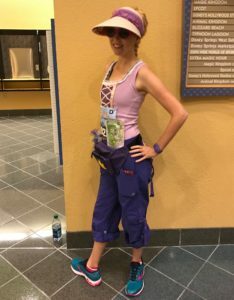 I re-wore the tank top I made for Princess Half in 2015, and wore purple cargo workout pants that were hanging out in my closet from my previous Zumba obsession. I bought a purple fanny pack and ironed on a printed image of the golden sun to give it some Punzie flair. 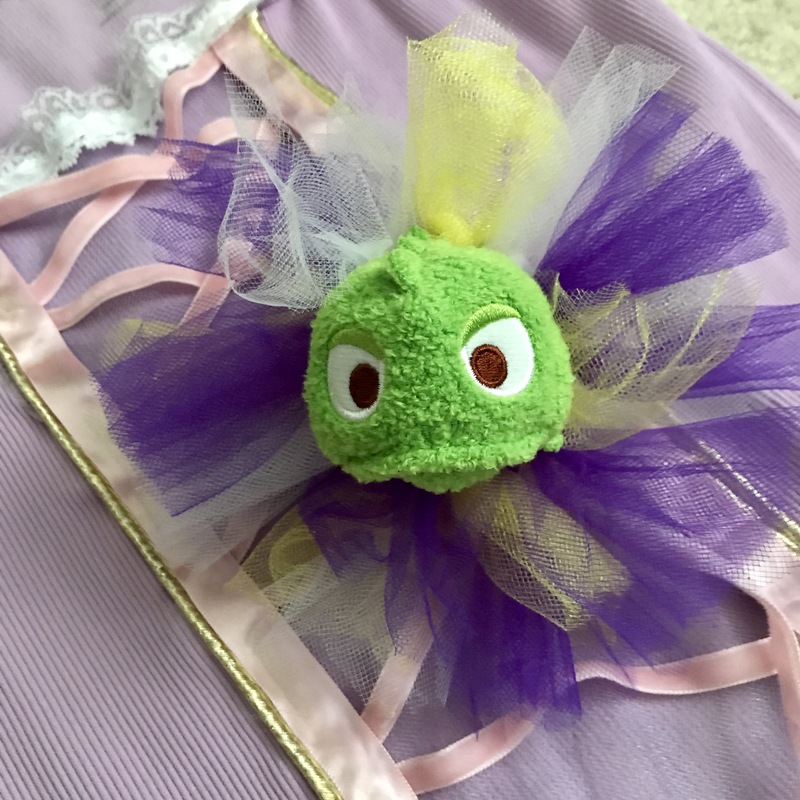 My favorite part of the costume was the little Pascal I pinned to the fanny pack. I gave him the tutu that I made for the Nemo I carried with me when I dressed as Darla for Disneyland 10k. Tacky tourist Rapunzel running costume. We had no problems getting to the corral area the morning of the race. We had a chance to hang out near the stage and dance to a couple of our favorite songs before heading off to our corrals. The race course for this race was similar to the Dark Side Half Marathon course, and we absolutely loved it! We got to run through Animal Kingdom, Hollywood Studios, and Epcot. 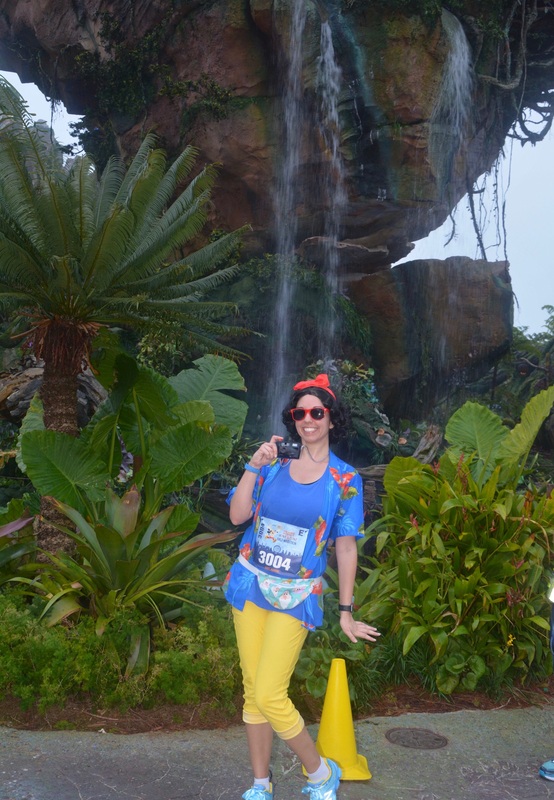 The best part of the race was that we had a chance to run through Pandora! It was so fun to run through this gorgeous land and it was a great photo stop! We also enjoyed running through Hollywood Studios with all of the Christmas decorations up. 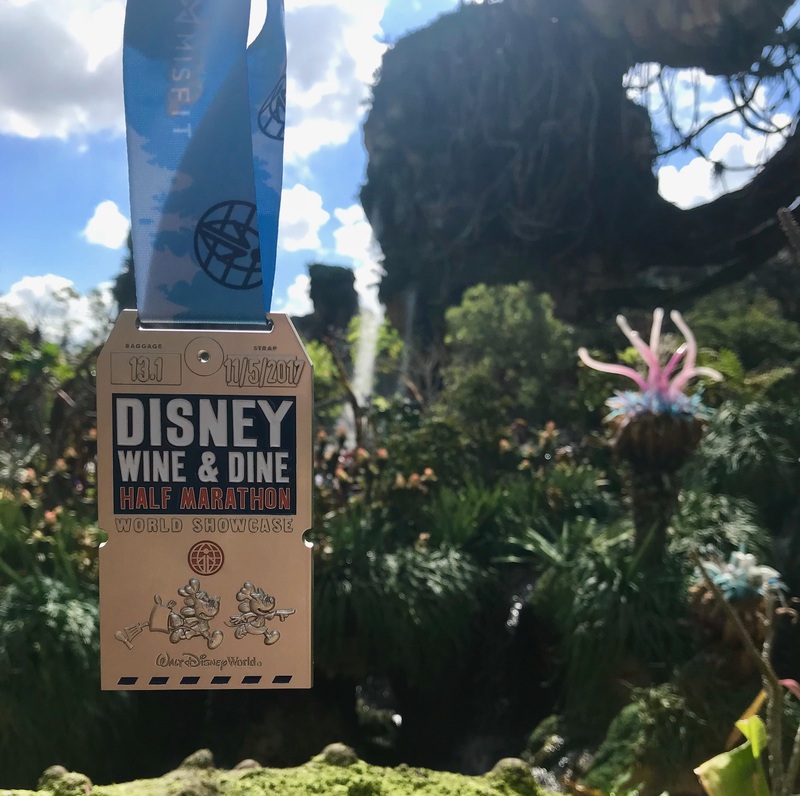 2017 runDisney Wine and Dine Half Marathon medal. The medal for this race was travel themed and looked like a ticket. We loved the detail on the medal and thought it was great that the medal changed again this year. 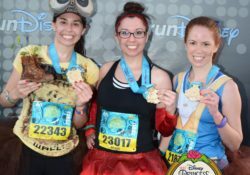 We love how runDisney is really changing up the medals! 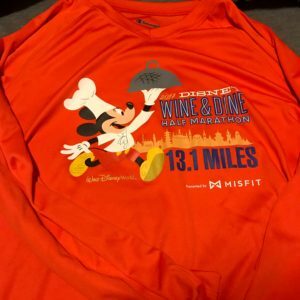 Out of all of the runDisney events, Wine and Dine Half Marathon weekend has the best perks. 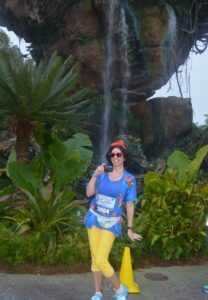 The best perk is that this is the only runDisney event that includes admission to one of the parks for a race event. 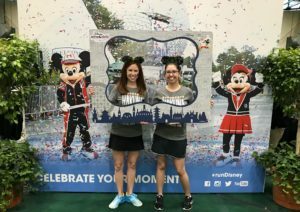 Runners who register for the half marathon or the two-course challenge (10k and half marathon) receive a free ticket to return to Epcot the Sunday evening after the race for a party in the park! The park is closed to the public during this event, so it is the perfect opportunity to relax and enjoy the Food and Wine Festival without a large crowd of people. Speaking of the Food and Wine, runners who register for the half marathon also receive a $15.00 Disney gift card that can be used to purchase food and drinks at the after party! Overall, we loved the after party, but there were some kinks that still haven’t been completely worked out. 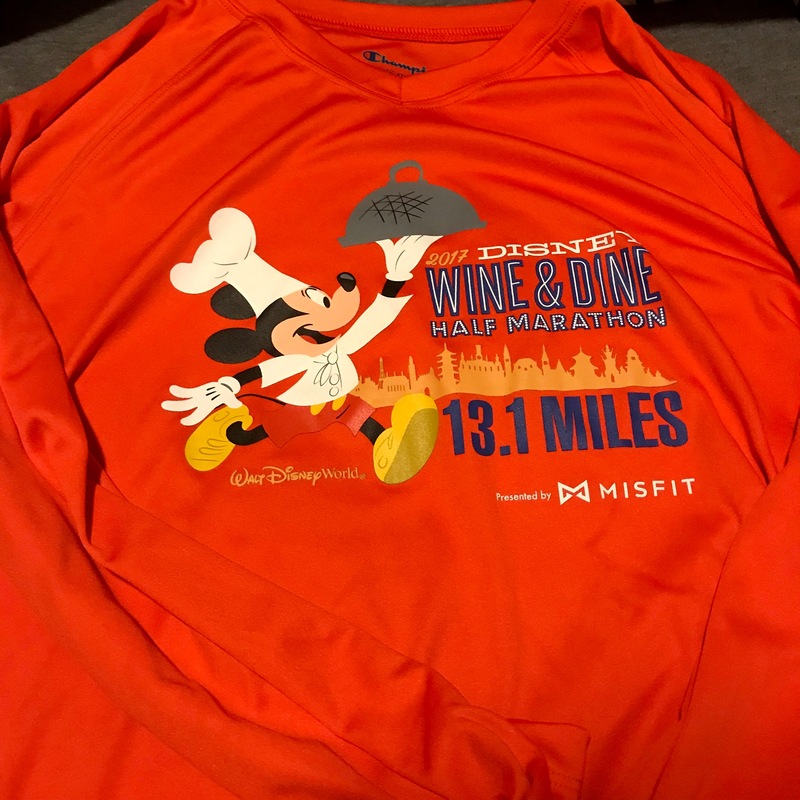 Traditionally, the Wine and Dine Half marathon was a night race and the after party happened immediately after the race finished. 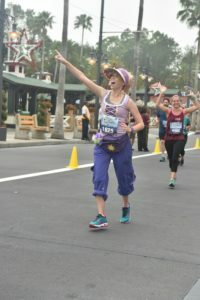 There was no need to re-enter Epcot because you simply finished the race in Epcot and went straight to the party. 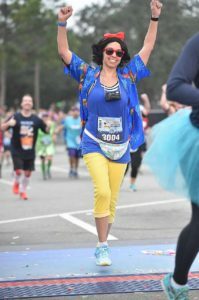 Last year runDisney changed the format of the weekend by adding a 10k and moving the half marathon from Saturday night to Sunday morning. The move to a morning race meant that the after party also needed to move to Sunday night. While the after party is only for runners, there is an overlap in the general park hours and the after party hours. 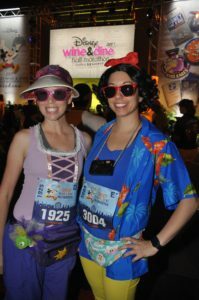 Runners can enter the park starting at 8:00 PM, but the after party doesn’t officially start until 10:00 PM. Epcot doesn’t officially close until after Illuminations ends which is usually shortly after 9:00 PM. The logistics of closing the park and accommodating a large crowd of runners entering the park is a little bit hectic. Last year we made the mistake of trying to enter the park as soon as possible and encountered a long line trying to enter the park. This year, we arrived closer to 9:00 PM, but we still encountered an issue trying to enter the park while many park guests were trying to leave after Illuminations. The major hiccup in the logistics is that all of the food booths and attractions close down in the time between official park closing and after party starting. This year and last year we ended up just sitting around in World Showcase waiting for the party to start. With that in mind, we highly recommend arriving at the after party at 10:00 PM or later vs. when the gates open for after party admission. 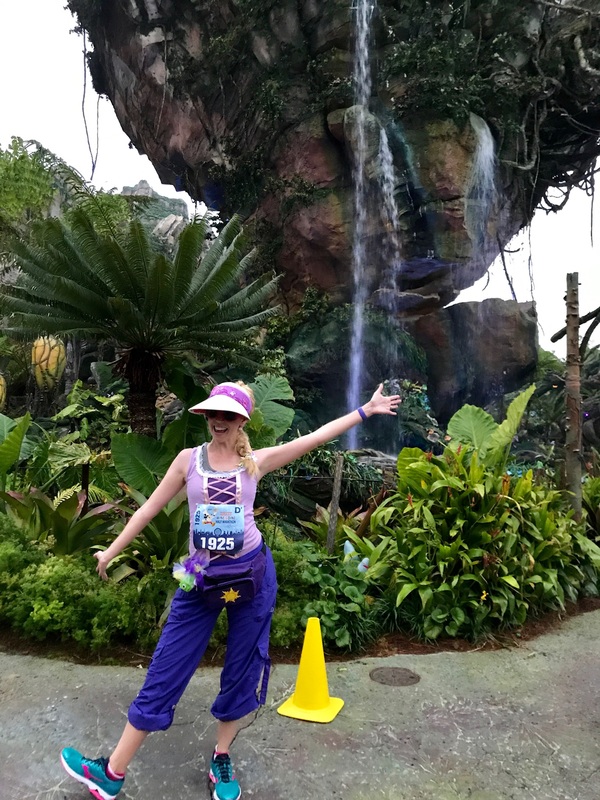 After getting up at 3:00 AM to run 13.1 run miles, the last thing you want to do is stand around waiting for food and water availability in Epcot. Hanging out with friends at the after party! Other than the hiccup at the start of the after party, we had a blast enjoying all of the festivities. We had the pleasure of meeting up with our friends Kimberly, Cindy, and Lindy during the after party. 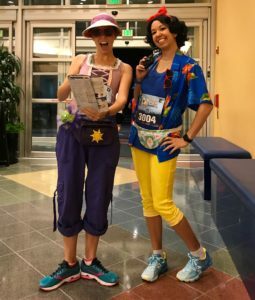 We took pictures with characters, enjoyed tasty foods and drinks, and swapped stories about how we got started in running and making crazy race costumes. After sleeping in a little bit on Monday, we headed to Magic Kingdom and Animal Kingdom for some extra magic. 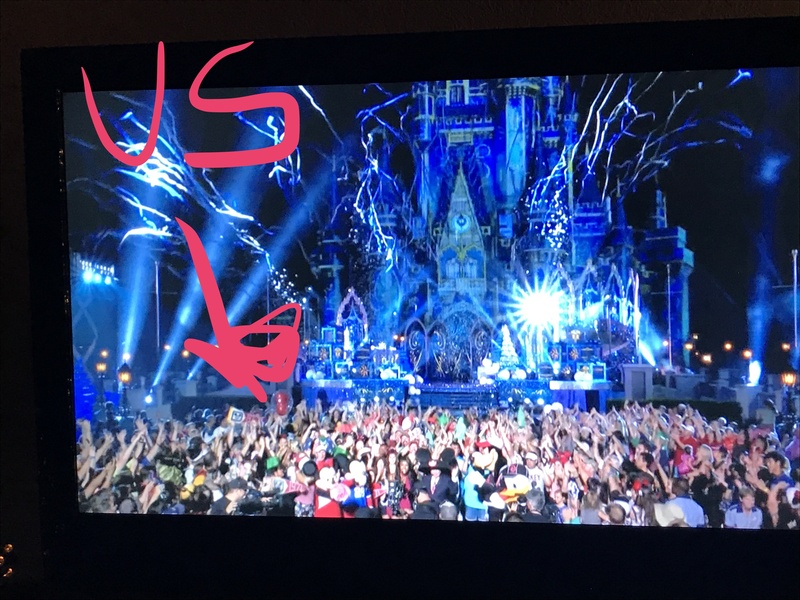 We were super excited because we got to attend some of the taping of the Disney Christmas specials. 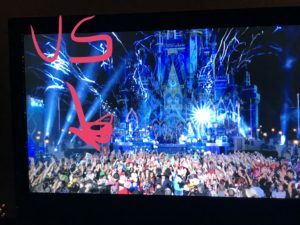 Melanie and I had a blast making our TV debut during the Magic Kingdom castle lighting. If you use a microscope you can see our epic performance in this picture. 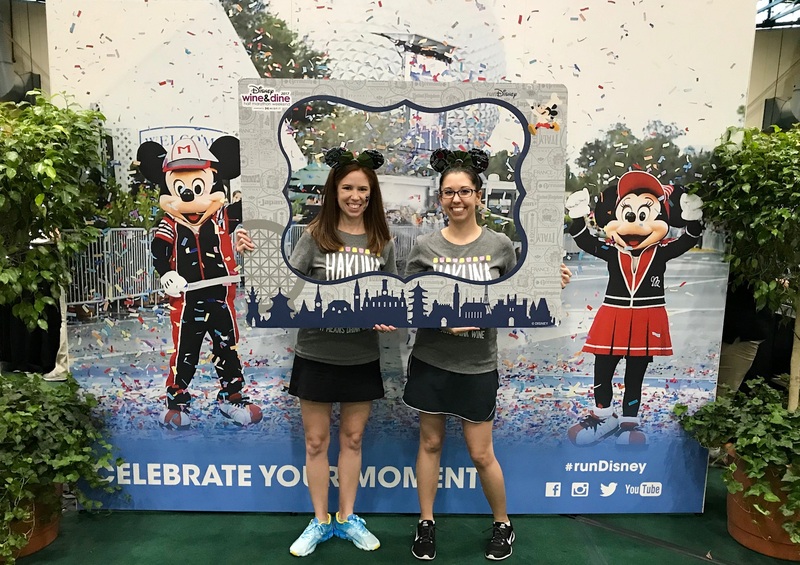 After making our TV debut, we made a quick stop back at home before heading out to Anaheim for the Avengers Half Marathon the next weekend! Even though this was a short trip to Disney World, we definitely packed in a lot of fun! That’s all for now, Team Tutu! Stay tuned for a recap of the Avengers Half marathon coming soon! Did you go to the Wine and Dine Half Marathon weekend? If so, let us know what you thought of the race weekend in the comments below.